This is a short guide to age-related macular degeneration, the leading cause of vision loss in the United States for people over age 60. Sherri Nordstrom Stastny, Ph.D., R.D., L.R.D. Age-related macular degeneration is the deterioration of the central region of the retina called the macula. The macula is made up of lutein and zeaxanthin — two carotenoids. A “healthy” macula, about the size of this letter “O,” is necessary for central vision. In age-related macular degeneration (AMD), central vision becomes blurry. Nearly 2 million Americans have vision loss from advanced AMD, and another 7 million with early AMD are at substantial risk for vision loss. AMD comes in two types: wet and dry. Dry AMD, more common and less severe, occurs when light-sensitive cells in the macula slowly break down. Untreated dry AMD can progress (sometimes very quickly) to wet AMD. Wet AMD is caused by abnormal growth of blood vessels under the macula. This leads to rapid loss of central vision. Wet AMD is otherwise known as advanced AMD. Medical treatments are limited and sometimes ineffective, so getting an early diagnosis is important. Know what the risk factors are, especially those factors that may be affected by your lifestyle choices. 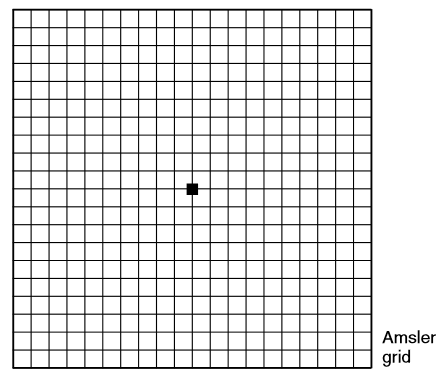 You can do a simple test using an Amsler grid to screen for vision problems caused by AMD. If you are at risk, using the Amsler grid test may lead you to receiving immediate care. But don’t forget your regularly scheduled eye exams. Hold the Amsler grid at eye level at a comfortable reading distance. Wear your glasses during the test. Cover one eye at a time and focus on the center dot. If you notice wavy, broken or blurry lines or missing areas of vision, contact your eye-care provider immediately. Research shows AMD occurs two to three times more frequently among tobacco smokers. The risk for AMD increases with the number of cigarettes smoked. Saving your sight is a great reason to stop smoking. Overexposure to sunlight as a teen has been linked to later AMD. Fair-skinned people also seem to be more prone to AMD, but whether previous exposure to sun is the cause is unknown. A recent study revealed that people with an active lifestyle are less likely to develop wet AMD. The 15-year study also illustrated that for each increased increment in the numbers of blocks walked (more than three times per week), the risk for wet AMD decreased accordingly. However, the study did not show an association for prevention of dry AMD. The incidence of AMD increases with age. The U.S. National Eye Institute estimates that while in their 50s, people have a 2 percent chance of getting AMD; this increases to 30 percent in those over age 75 (and up to 57 percent in those over age 90). Age is the largest risk factors for AMD. The healthy eye of an individual with advanced AMD in one eye is at risk for AMD in the other eye. Together, age and disease in the other eye are the largest risk factors for AMD. Another study demonstrated that diet can change the amount of macular pigment in the macula despite genes. The study looked at differences in diet among identical twins. Although the study was small, it shows promise that what we eat can prevent or at least slow down AMD. The incidence of AMD is most common in white women over age 60. AMD occurs more frequently in blue-eyed white females in the United States, the United Kingdom and other countries, as well, according to published epidemiological studies. See NDSU publication FN709, “Eating for Your Eye Health,” for important information about nutrition and eye health. Dozens of studies on nutrition and AMD point to a relationship between increased fruit and vegetable intake and a decrease in the risk for both dry and wet AMD. More research is needed to draw any conclusions, but clearly, increased intake of certain fruits and vegetables is indicated for better eye health.